Discover Our Exciting Summer Camp Opportunities in Duluth GA! Summer is just around the corner, which means it’s time to get geared up for summertime fun. 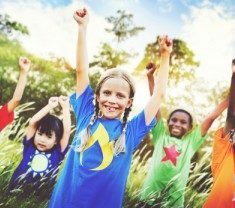 At Discovery Point Satellite, we’re proud to offer an exciting summer camp opportunity in Duluth GA that integrates fun and learning to help children experience the full potential of their summer vacation. Our program takes campers on a ten-week-long adventure that encourages them to build crucial skills, bond with other campers, and gain confidence. We have so many fun activities planned, and we can’t wait to share them with you! Keep reading to learn more about our summer camp program for the upcoming season. Our “Mighty Me!” summer camp program revolves around developmentally appropriate selections of children’s literature that inspire weekly themed adventures called “mighty missions.” Every mission includes hands-on activities and skill-building exercises that encourage campers to use their critical-thinking skills, be creative, and become team players. Children will get to unravel thrilling mysteries, go on adventurous excursions, and discover their own unique talents and “superpowers.” Plus, they can look forward to forming close relationships with other campers while making precious memories that will last a lifetime. Our program presents weekly literature-based themes that offer inspiration for our dynamic activities and exciting excursions. These themes cover a range of engaging topics to hold children’s interest, from animal rescue and superheroes to meteorology and dinosaur digs. Campers will learn valuable lessons in a hands-on manner, exploring the importance of teamwork, friendship, kindness, self-esteem, and resourcefulness. Our exciting adventures give children the opportunity to use their imaginations as they play the part of an expert archeologist, a clever detective, and a much-loved celebrity. As they challenge themselves to build relationships and see the world from different vantage points, they’ll learn how to uncover the true hero within. It’s easy to learn more about the opportunities our summer camp program offers for your child. Just call Discovery Point Satellite at (770) 418-1901 for details or make a stop at our child care center in Duluth GA today.